Astronauts have long enjoyed various foods dehydrated by a process called freeze drying. 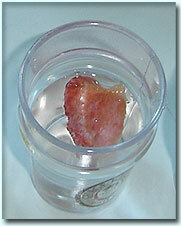 Most well known is "Astronaut Ice Cream" but many others are dehydrated including fruits like strawberries. The freeze drying process involves freezing the food and placing it in a low pressure vacuum chamber. The food is then slowly heated allowing all the water in the food to slowly sublimate (go direct from ice form to gas form) and be removed resulting in a food product with a texture similar to cardboard. Without the water the food can be extremely light and carried easily for space travel or camping - but at the same time - nothing like what it once was. In this experiment Scientific AmeriKen will attempt several stratagies to restore a freeze dried strawberry back to its former glory! Scientific AmeriKen is exploring several strategies to revive the strawberries as also comparing them on a time scale. Under the assumption that revival of the strawberries requires the delivery of water across the cell walls of the strawberries Scientific AmeriKen will attempt water and hot water as it is believed the faster moving molecules would be more successful at hydrating the strawberry. Alcohol will be used with the hypothesis that the properties of the alcohol molecules may have an advantage in entering the strawberry cell walls. Milk was used based on the hypothesis that the proteins inside the milk could ease the path of the water into the strawberries. Finally Orange Juice was used under the thinking that since orange juice and strawberries are both fruits that the strawberries will open its arms gladly to the incoming orange juice. 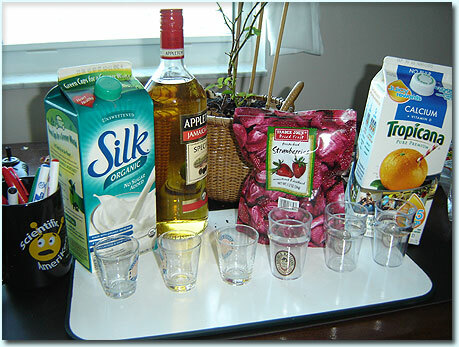 Materials (Pictured on right) include 5 glasses to hold the strawberries, stopwatch, freeze dried strawberries, a milk source (Silk Soy Milk used), Orange Juice, Alcohol (Rum used @ 40% Alcohol(v/v)), water, a knife, microwave and a computer to take notes. To begin the experiment 3 sets of six strawberry slicers where chosen from the freeze dried strawberry bag. The sizes were approximately similar is size. Liquids were then placed into individual glasses (figure on right). 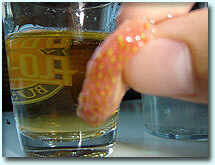 The alcohol was mixed with an equal volume of water to create a 50% solution. Water was heated for 30 seconds in a microwave to reach boiling. Strawberries were then placed into glasses and a timer was started (Figure on left). Due to the tendency to float strawberries were submerged with a knife on a periodic basis. At the conclusion of a time trial at either 10 seconds, 1 minute or 10 minutes - strawberries were examined for "strawberry like" features as well as tasted. Their ability to be restored as hydrated strawberries were judged on a fail, partial or success scale, where fail is cardboard like and success is strawberry textured like. It appears that simply dropping the strawberry in water for 1 minute was all that is needed to salvage the strawberries and Scientific AmeriKen was making this much more complicated than it really needed to be. These data suggest that in fact regular cold water was the best or equal to other techniques and may be useful information to a camper lost in isolation with nothing but a canteen and a bag of freeze dried strawberries. Also, two unexplained results are the failure of the 50% rum solution (20% alcohol) at 10 seconds and the soy milk. Although no explanation will be attempted for the alcohol, the soy milk is most likely due to the blocking of the milk proteins by the strawberry cell walls. Initially hypothesized to assist it was in fact demonstrated to prevent rehydration, which may be interesting information for those who want a crunchy breakfast cereal made of freeze dried strawberries. 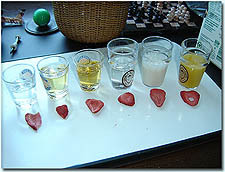 Finally and also of interest was depending on the solution used, the strawberry would pick up the flavors of the solution resulting in orange-strawberries or rum strawberries - further experimentation maybe required in this area.